Environmentally safe polystyrene insulation, 1 3/8” to 2” thick, depending on the garage door model, is sandwiched between two layers of steel for excellent energy efficiency, beauty, durability and quieter operation. Not simply for inclement weather, the Steel Sectional Premium collection provides exceptional sound suppression qualities. 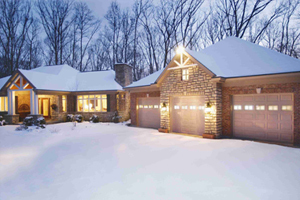 These premium, steel garage doors are ideal for clients that want the maximum weather resistance with the increased privacy of a triple insulated door.